Max Creese Motor Cruiser 34 "Just Flo"
Timber Dynel covered - Double diagonal planked (King Billy) on Celery Top frames. 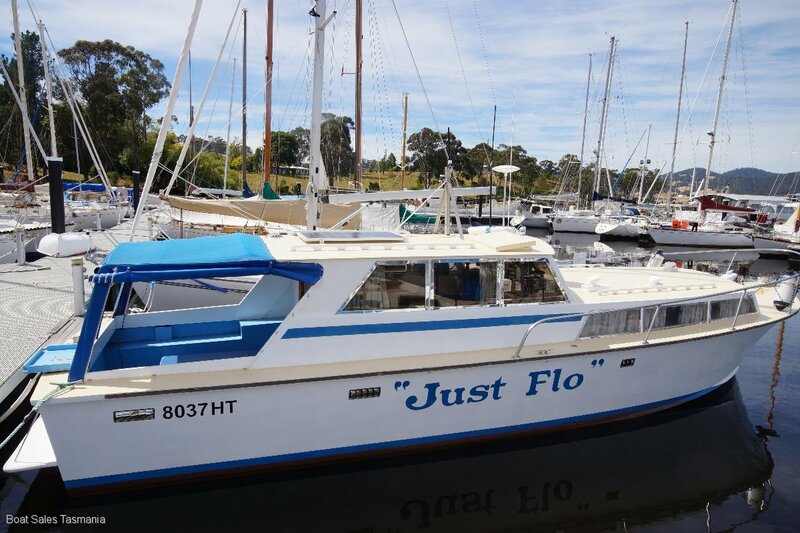 "Just Flo" is one of the best family cruisers in her class that we have seen. In terms of design, build quality layout and condition. The presentation is a credit to her experienced (and only) owner. 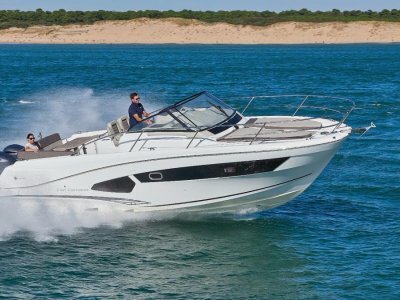 The accommodation makes for the ideal family cruiser. Two private cabins (6 berths) a large well equipped galley and bathroom. 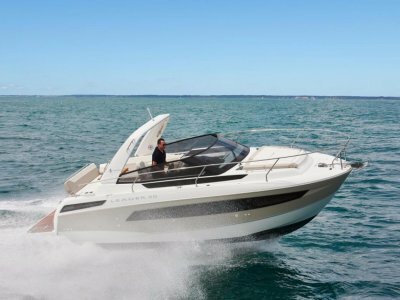 Cruise at 8 knots in safety and comfort. 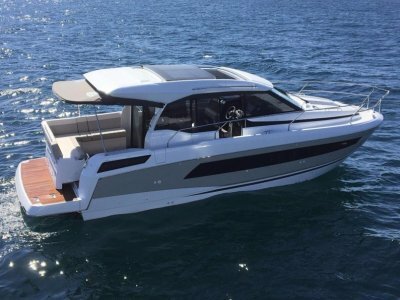 If you are in the market for a family cruiser let us show you on board "Just Flo" you will not be disappointed. "Just Flo" is simply outstanding in all respects. 10 to 12 lph at cruise speed. The large covered cockpit has weather proof side curtains. Step into the saloon. The dinette (seat 8) is to port. The table drops to provide an occasional berth. To starboard is a settee berth. The back of this settee hinges up to provide a full sized pilot berth. Just forward is the fully equipped helm station. Forward again is the bathroom. Opposite (port) is the (long) full sized galley. To starboard (forward of the bathroom) is a private, single berth cabin. The owners (twin berth) cabin is forward of the bulkhead. Sleep 3 in private cabins, 6 in berths plus one in cockpit if required. Head room: Saloon 6'4", Galley 5'11"
Electric toilet in the bathroom. The long galley is amidships and to port. It includes a large bench with cupboards under, a stainless steel sink with drain board with hot and cold water plus a saltwater tap. A Flavel (English) gas stove/oven/grill. Plenty of bench top and locker space. All cutlery and crockery on board is included. Dometic 3 way upright fridge. Heat exchanger with a 40 litre copper hot water tank. 35 lb CQR (main anchor) on over 100 metres of 10 mm chain. Muir Cougar Electric winch with remote at the helm. Spare anchor - 30 lb Danforth. 2 x Rule 1500 Electric Bilge Pumps. Vetus switch panel with fuses. Waeco Mobiltronic 100 watt invertor. 1 x 240 volt power socket. Glomex TV Tuner (TV not included). 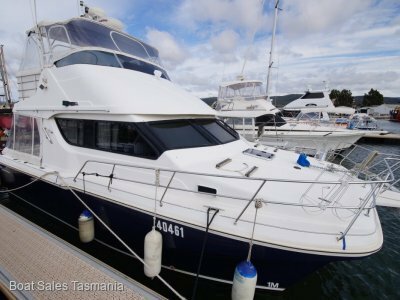 Berth on the Port Huon Marina is available.